The Montana rental agreements create binding arrangements between a lessor and a lessee over the usage of commercial and residential property. All contracts must follow State laws under Title 70, Chapter 24 and once all pages have been initialed including the proper disclosures and the contract is signed the form becomes legally binding to all those involved. The tenant and landlord may only cancel with both parties consent. Rental Application – To be used by the landlord to verify that the tenant is credible by checking with their current and previous employers, references, and viewing their background. Commercial Lease Agreement – For space that is not livable, rather for a business or any type of non-residential use. Lease with Option to Purchase (Lease to Own) Agreement – Form with the added benefit to the tenant of being able to purchase the property according to the option’s conditions. 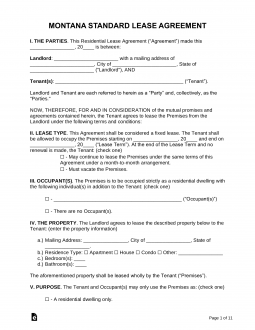 Month to Month Lease Agreement – Known as a tenancy at will with no end date but according to § 70-24-441 it can be terminated with at least thirty (30) days’ notice. Room Rental (Roommate) Agreement – For the shared living arrangement of individuals in a common residential dwelling. Standard Residential Lease Agreement – Typical fixed arrangement, usually twelve (12) months, for any type of residence. Sublease Agreement – Used when a tenant is seeking to elect someone else to take over the remaining responsibility on a lease they are bound to until it’s termination. Termination Lease Letter – For creating an end date for a month to month arrangement for the minimum of thirty (30) days’ notice as allowed by § 70-24-441. Mold Disclosure (§ 70-16-703) – Language is required in all rental contracts or this form to be attached to acknowledge that the landlord has no prior information about any mold existing on the premises. Lead-Based Paint – Disclosure that is required for all residences built before 1978 to give notice to tenants that the paint on the interior may contain this hazardous substance. Move-in Checklist (§ 70-25-206) – If the landlord accepts a security deposit this document must be attached to the lease and the tenant should inspect the property for pre-existing damage. Landlord/Manager/Agent Identification (§ 70-24-301) – The person authorize to enter the premises must be stated in the lease in addition to an address for notices by the tenant. According to § 70-24-312 the landlord must grant at least twenty-four (24) hours notice to the tenant before entering the premises. Maximum – No limit. The landlord may ask for as much as desired. Returning (§ 70-25-202) – All funds must be given back to the tenant within ten (10) days if there are no deductions to the deposit. If there are deductions an itemized statement must be given along with the funds being returned within 30 days.